“So this is ‘the’ IP University”, I said in awe when I first entered the gates of the University. A college can be quite intimidating for someone who has just given his board exams. We toil through the board exams with utmost vigor and effort, only to find ourselves facing the competitive exams, Thankfully, I gave all of my competitive exams with equal interest and enthusiasm. We all entered IP University with a lot of pre conceived notions. But on that first day when I saw the grand main gate of the university I could feel my notions breaking away bit by bit. As I entered the campus I could distinctly observe the juxtaposition of modernistic buildings with tall trees and green lawns something rarely seen in a university campus. I could also feel the cheerful peacefulness in the air which was full of vibrancy. As I moved ahead in my exploration of what was going to be my second home for the next five years, I found out that the campus was in abundance of eating joints and sports facilities. The classrooms seemed spacious and so did the auditoriums. They say a place is only as good as the people you know in it, for it is the people who make a place. When we freshers sat in our first lecture we were complete strangers. We all had inhibitions and were full of nervousness. Little did we know that it wouldn’t take long for the ice to break and the classes, or should I say the time between the classes, to be moments of fun to look forward to. During the first week of college itself we were able to interact with our seniors. 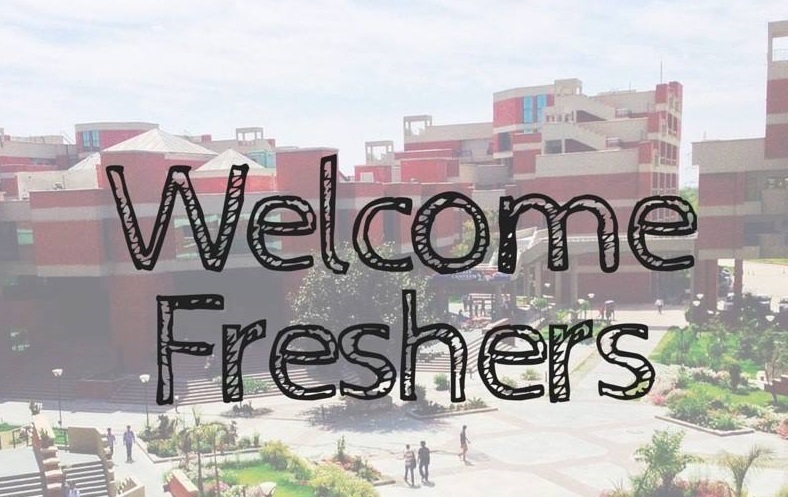 Senior students at Indraprastha University, be it from any of the schools, are extremely helpful and polite. In our first week seniors came up to us and introduced themselves, something that helped us adjust to this new environment very easily. Like every fresher I had high hopes from my freshers party, and I must say those expectations were more than reached. We ate with our seniors, we danced with our seniors, we laughed with our seniors, and all in all we had a gala time thanks to our seniors and the faculty members who took the effort to organize the fresher’s party for us. Professors too in my college were instrumental to help us get into the tempo of college education and understand the rhythm of this new form of studying. Starting off on a slow beat they gradually built up to a crescendo. Coming from a system of ‘Syllabus books’ it was a refreshing change to have our professors recommend extra readings and in fact encourage them whole heartedly. Another person who seemed to be very welcoming was the stationer, who helped me get those books whose names seemed almost incomprehensible. The campus is quite large and you shall be lost if you weren’t with someone who knew his way around. However I must say getting lost in this beautiful campus does have its share of advantages. In my first week me and my friends rarely had a clue as to which path will lead to where and we would get lost only to end up at the Nescafe shop, attracted by the homely smell of good old Maggi. The canteen too is a great place to relax after the classes, the air conditioner on the first floor of the canteen works freezingly well. However the best thing that I discovered during my initial two weeks was the Kendriya Bhandar outlet in campus, where one can buy packets of chips to snack on during the class. The true beauty of this campus though lies in the various activities organized regularly. With so many colleges close together there seems no dearth of activities. By the end of the first few weeks I ended up attending almost all activities and giving trials for almost all clubs. There is an extra emphasis on academics in IP University. With projects and assignments being given regularly the class seems to have pulled up its socks and have set to work yet again. The freshers experience however doesn’t end just yet. We are yet to experience our first tests, our first fest and our first mark sheets. We also know that the coming times bring with it turbulent tides when this new support structure, i.e. IP University that we have so readily and eagerly accepted will be put to test. Until then i just hope that this freshers’ experience doesn’t cease. With this I bid you good bye and rush of for some more Maggi at the Nescafe parlour.